Custom home building has become incredibly popular in recent years, as more and more homeowners are taking steps to regain control over every aspect of how their homes are built. This is especially true for homeowners in Jefferson County, Tallahassee, and the surrounding areas where there are plenty of opportunities for residents to build the home of their dreams. And who can blame them — after all, your home is where you will spend a majority of your life, so why not have it built exactly how you want it to be? As the leading home remodeling and custom home building company in Tallahassee and Jefferson County, Vanguard North is the go-to for new and veteran homeowners alike as they embark on the journey of building their ideal custom home. Having been in business for more than 35 years, we have been fortunate to build, remodel, and renovate hundreds of homes in the area, and our experienced contractors look forward to every new challenge that comes their way. It all comes down to our genuine passion for building and recreating unique living spaces that our customers will enjoy for years to come. At Vanguard North in Monticello, home improvement is our specialty, from simple kitchen, living room, and bathroom remodeling to room and house additions, home remodels designed from scratch, and complete custom home building. Given our decades of experience and an impressive portfolio to show for it, no project is too big or small for our contractors to take on. We’ve done farmhouses, lake houses, and luxurious modern homes, so trust us when we say we’ve done it all — and we do it well. Take it from our former customers who have reached out to show their thanks and appreciation for all that we do! All things said and done, custom home builds are some of our favorite jobs to take on here at Vanguard North. There is nothing quite like seeing the look on a homeowner’s face when we have finished building their house from the ground up according to their vision, and it is this rewarding feeling that keeps fueling our passion for the trade. That being said, let’s dive into some of the reasons why so many Tallahassee and Jefferson County homeowners are choosing to build a custom home, rather than buying one that already exists. There are many benefits of building a custom home here in Tallahassee and Jefferson County — and contrary to popular belief, it is not something only the wealthy can do. As it turns out, custom home building can cost as much or as little as you want it to, given that the design, features, and budget are for the most part in your control. In fact, Home Advisor estimates that the average cost of building a custom home in Florida is $317,588, with most projects residing in the $299,294 – $344,117 range. So don’t let the notion that custom homes are for the rich and famous keep you from pursuing your dream home, because in reality, custom home building is the future of real estate. What was once a luxury is now becoming the norm for homeowners across the country, and it is custom home builders like Vanguard North that are making it possible. Aside from the fact that nearly anyone can do it, here are some benefits of building a custom home! One of the main reasons why so many people decide to build custom homes is because they are in control of the project from start to finish. 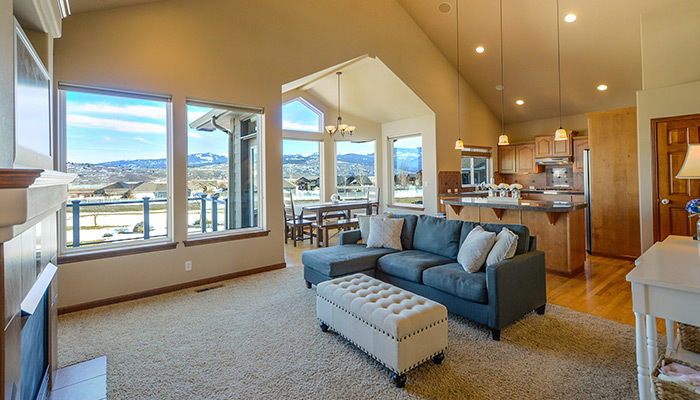 Unlike other general contractors that build a row of identical little boxes on the hillside, our custom home builders allow you to be in charge of all the technical and aesthetic aspects so that your home is built exactly how you want it. This gives you the opportunity to be involved in the custom home building process, rather than sitting by the wayside while strangers build the house you’ve paid hundreds of thousands of dollars for. While this might sound like a lot of work, it really isn’t — we help you every step of the way, from the creation of the initial floor plan to picking out the materials and interior design elements. At Vanguard North, we even have an interior designer on staff (the owner’s wife, Donna McPhate), who will work closely with you to pick out the home features that best compliment your custom floor plan, your lifestyle, and your unique tastes. The best part of it all is that you are in charge of providing us with your vision and stylistic preferences while we do all the dirty work! Since you are in control of the decisions that are made during the custom home building process, you can expect your custom home builder to be in constant communication with you as they make critical decisions. This can include anything from the building techniques and materials that are used to the finer details such as house paint colors, kitchen features, and other aesthetic elements. No matter what your custom home build looks like, you can rest assured knowing that the contractors’ decisions will directly reflect your vision while staying within your budget — and that you will be kept in the loop every step of the way. Part of what sets Vanguard North apart as the leading custom home builder in the Tallahassee metropolitan area is our transparency in everything we do. Upon entrusting us with your forever home, we will discuss all the technical aspects with you, from the financial side of things to which building methods and integrated technology is best for your home. Interested in a custom open floor plan for your master bathroom with all the latest features? You got it. Want heated floors powered by solar panels on your roof? No problem. No matter what your dreams are, you can count on us to sit down with you and lay out what it’ll take so that we can offer our expert opinion and form a game plan. While there are many other benefits of building a custom home here in Tallahassee and Jefferson County, the main reason why so many homeowners are choosing to go this route is because the end product is a true reflection of their unique style and way of life. No other kind of new home construction can match the personalized touches of custom home building, as the entire project is created with one person, couple, or family in mind. Given that custom homes are truly one-of-a-kind, you will feel much more at home there than you ever would in a little box on the hillside. Your custom home is a place where you can thrive, make memories, and really call your own. At Vanguard North, this is our favorite aspect of the custom home building process — hands down. Helping local homeowners bring their wildest dreams to life is a tremendous honor, and the gratification our contractors get from it is the best reward there is. No two custom homes we build are the same, and each one is a unique project that we can learn and grow from for years down the road. At the end of the day, one thing remains the same: our skilled workmanship and dedication to our customers pays off when they are introduced to a brand new custom home that was made just for them. Now that you know some of the main reasons why so many homeowners are choosing to have their houses built from scratch, it’s time to consider whether custom home building is right for you. Have your kids grown up and moved away, leaving you with a house that no longer feels like home? Do you want to retire and relocate to a custom beach house along the Gulf of Mexico? Are you ready to finally develop the land that has sat empty on your property for years? No matter what your dream home looks like, all it takes is a vision, a budget, and a solid game plan with our experienced custom home builders to help you along the way. With Vanguard North as your trusted custom home builder, the sky is the limit for what we can do, whether that be a custom beach house, farmhouse, or a luxurious suburban getaway in the heart of the city. Our contractors have all the skills, tools, and experience needed to make your custom home dreams a reality, and it all starts when you reach out to us. Upon choosing us to build your custom home, we will sit down with you to discuss your goals, provide a free estimate, and form a plan of action moving forward. From there, we will work with you every step of the way until the project is finished to the highest standards of excellence — and only then will we consider the job complete. Ready to get started on your brand new custom home? Browse our site for more information about our team and the work we do, and give us a call today to get started! We look forward to building your one-of-a-kind dream home in Tallahassee and Jefferson County.